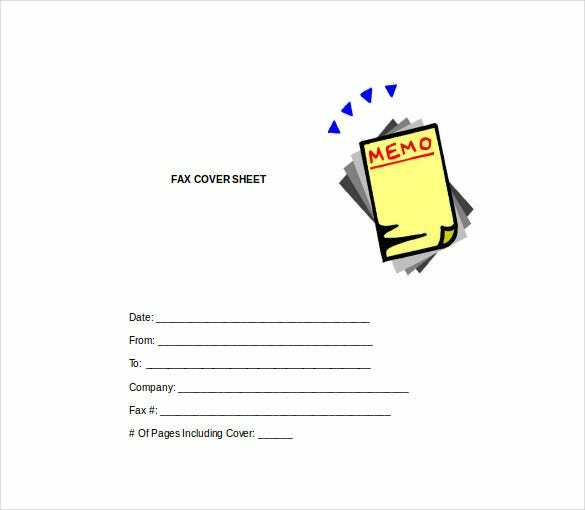 Cover sheets are an important part of presentations, whether it is an assignment for college or some documents that need to be faxed. A cover sheet mainly bears the metadata, which includes name, contact details and other such information. Cover sheet Template help save a lot of time and since they are developed by professionals, these templates do not run the risk of formatting errors. 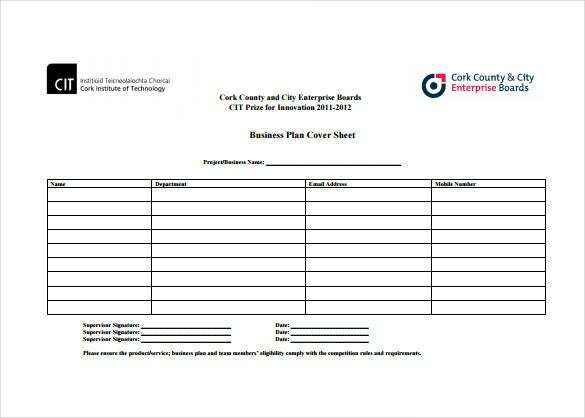 The cover sheet template comes ready to use and can be edited to be used again. They come in different formats for the convenience of the users. These Sheet Templates can be downloaded in Excel, Word and PDF formats. 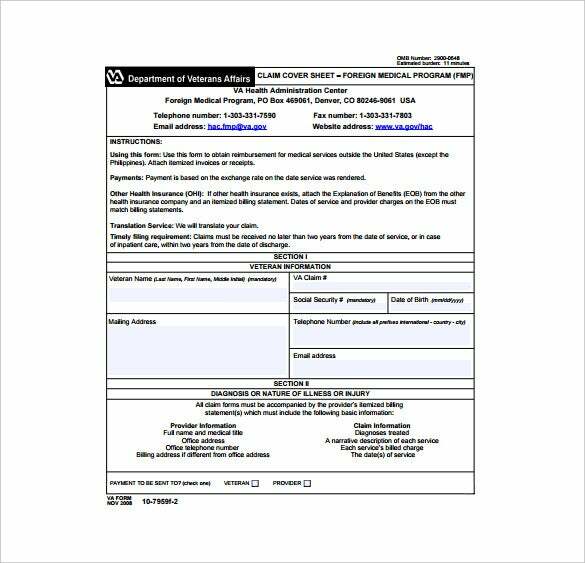 va.gov Claim Cover Sheet PDF Template is available for free download online. This template is related to Foreign Medical Program (FMP). 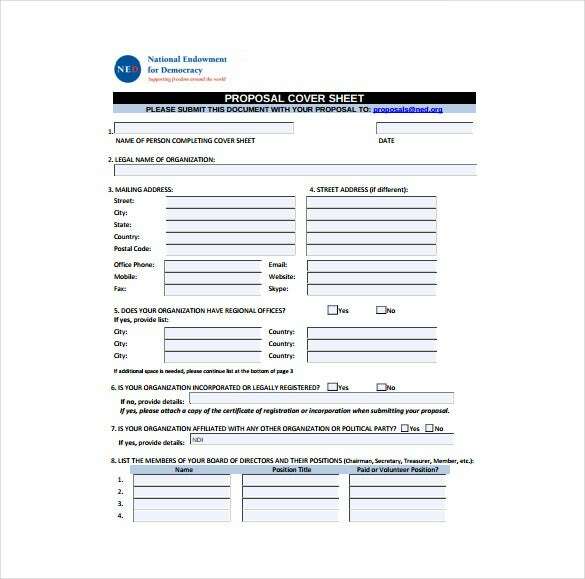 It comes with instructions of using the claim cover form on reimbursement for medical services in a foreign land, payments, translation service and timely filing requirements of the claim cover. 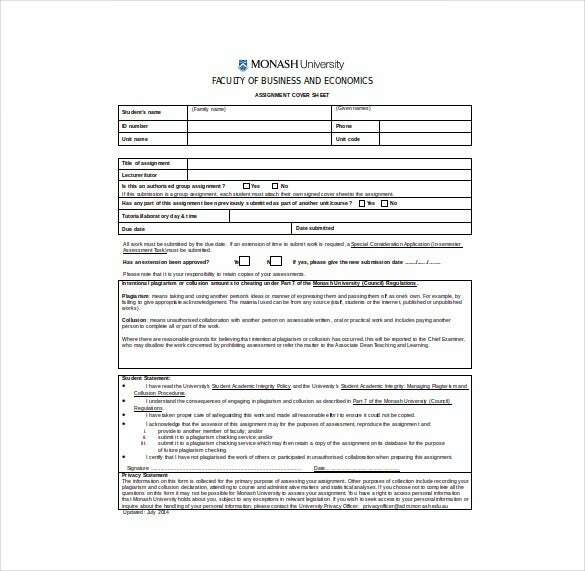 buseco.monash.edu.au Assessment Cover Sheet Word Template as the name suggests is assignment cover form that comes clearly with all the guidelines to fill and complete the form such as the due date, terms of extension of submission of your work. It also includes stern warning against plagiarism and collusion with unauthorized collaboration etc. Students have to sign to certify the student statement filled in the form. 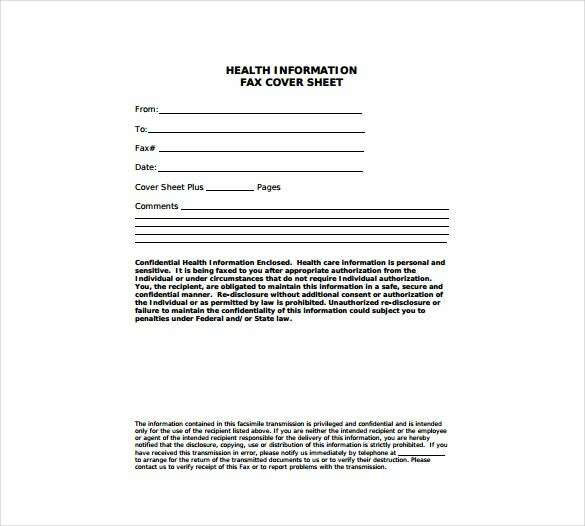 maine.edu Health Information Fax Cover Sheet Free PDF Template is the simplest fax cover sheet you will find anywhere. 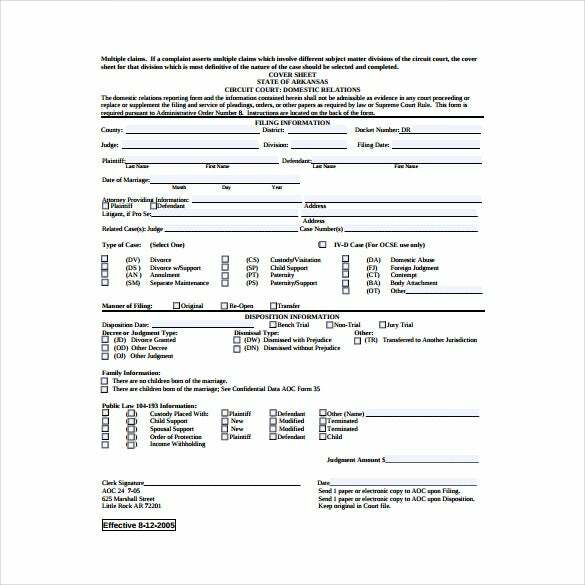 It is the easiest to use this form for quick fax but still contains all the columns to fill all the informations such as fax number, date, and number of cover sheet pages, comments and the instructions on the privacy of the documents faxed. 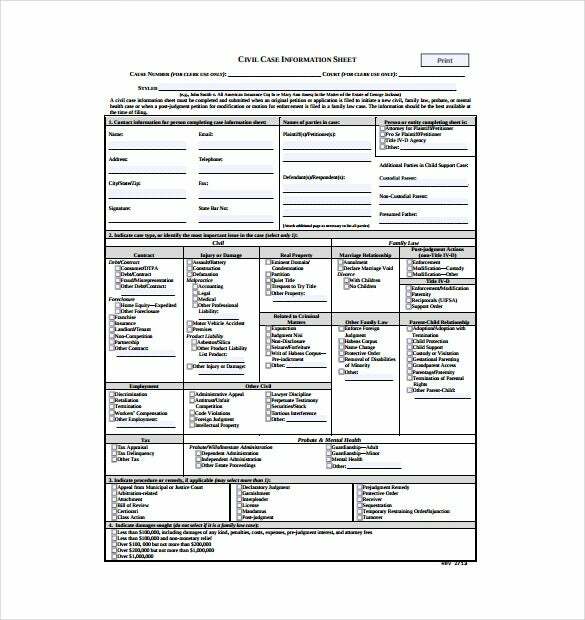 mams.rmit.edu.au Assignment Cover Sheet Word Template is available for free online download. It contains columns to fill course and unit code/name, assignment number and due date, group/session name. It also includes selecting either lecturer or tutor’s name and the title of the program. 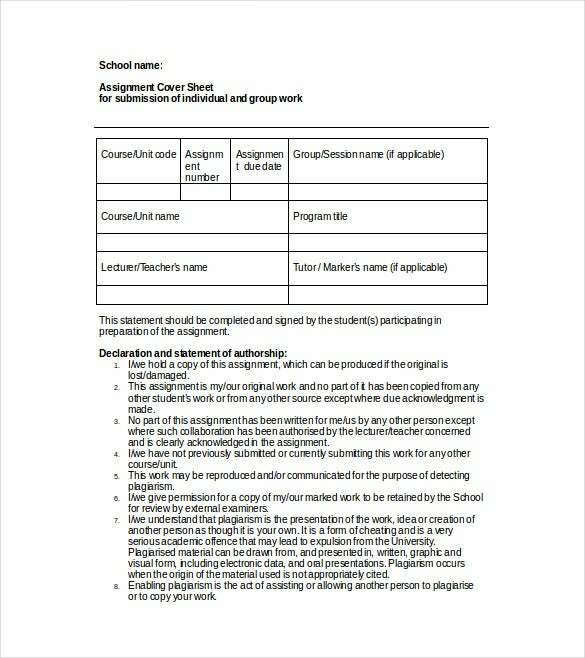 You also have to declare and sign the statement that your assignment not plagiarized or copied and the penalties to pay if found as copied assignments. > What are the top Uses of Cover Sheet Templates? It is best to keep the cover sheet design simple to understand as it attracts more concentration as compared to the complicated ones. The contents of the cover sheet need to be good and includes main and important informations etc without having to write a long story but by writing a message that convey the work related. There are many options to create effective cover sheets. With various cover sheets available easily online, you can make a clear-cut cover sheet that makes efficient response that fit your requirements delivered effectively, saves time and money without having to make silly mistakes. > Who all can use Cover Sheet Templates? 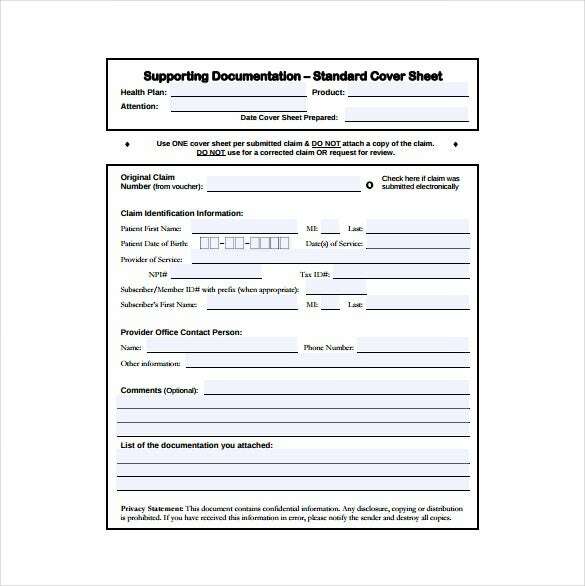 Cover sheets play key part in any presentations related to office documents, student assignment for colleges or universities that require you to fax. Cover sheets contain the main details such as name, contact, fax number, title, instructions and many such details. By using cover sheet templates, you save abundance of your time and already formatted without errors as experts prepare them. They are available in various formats in MSWord, PDF and Excel formats and hence easy for the users for quick download online. These templates are free and provide you the most professional answer without having to spend for them. > What are the Benefits of using Cover Sheet Templates? If you are looking for excellent cover sheets, then go for the cover sheet templates available online for free as professionals create them. You can record your details such as business, assignments etc related in a systematic manner. They are very easy to use and at the same time will help you convey the right message as they are already shaped and formed on your behalf. You can easily edit and modify the columns and sections from the original cover sheet templates and customize the cover sheet template as per your requirements and ready for use in a span of minutes. 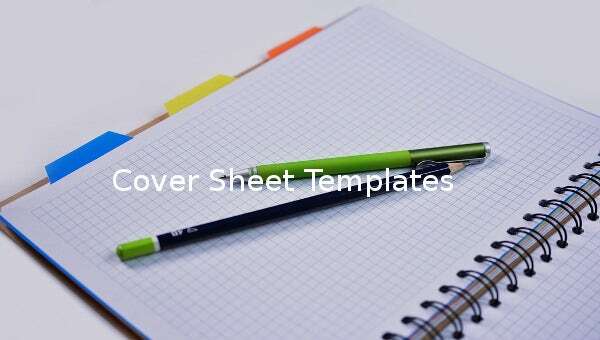 Hence, for creating your cover sheet, the best option is to go for the best cover sheet templates online, which are easy to use, free and customizable. That way, you get an amazing cover sheet, which covers all your metadata and other important informations in a clean and systematic manner.